Through the course of life, all of us move in and out of our favorite hobbies, sporting interests, and choice of alcoholic beverages. We literally forge alliances, loyalties and stay together for a while and then drift apart. More often people make temporary associations built on coincidence, affordability and circumstances. My choice for leisurely, social consumption of alcohol started with beer and I stayed with beer for a long time. I never developed a taste nor preference for wine. When I became a diabetic few years ago, having a few beers occasionally became a concern due to the high carbohydrate content. I reluctantly started to test the taste of Scotch whiskey since it was more acceptable along with vodka. 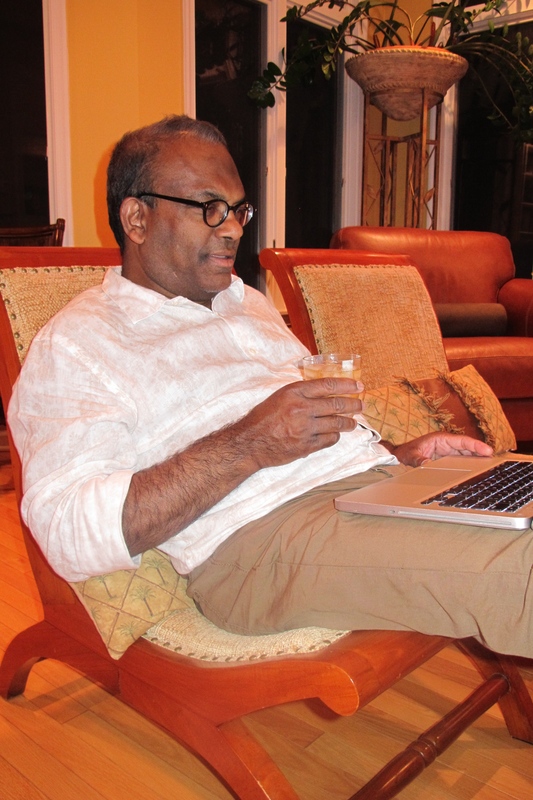 I never liked vodka and started to have an occasional Johnny Walker Black, although it was the rich man’s drink when I started my professional life as a young engineer in Sri Lanka. In the meantime, a very good friend of mine at work introduced me to single malt Scotch – Glenlivet I think – and I have been discovering the joys of single malt Scotches of various flavors and tastes since then. Scotch is one of those special spirits that has managed to distill the essence of the place into a bottle. A combination of Scottish barley, smoke from a peat-fired flame and clear cold water conspire to give the drink its distinctively bold flavor. Scotch can only come from Scotland, in the same way that Tequila can only come from parts of Mexico or Champagne from France. The word “whisky” itself (“usquebaugh” in Gaelic) means water for life and I believe that in spirit – no pun intended. The pictures show myself relaxing and enjoying a Laphroaig on the rocks while working on my computer at home and my most favorite single malt Scotches.